My dear friends – this blog hasn’t seen too much action lately and to be honest neither has my kitchen. Since the universe wouldn’t give me more hours in the day (thank you, universe) I decided to scale back so I can start to enjoy the simple pleasures in my life. Food is an amazing, beautiful thing and we have the power to live a life where cooking and eating can be nourishing for the soul and taste damn good at the same time. I recently signed up for a CSA basket (Community Supported Agriculture) from Coral Tree Farms – a gorgeous family owned farm right in the heart of Encinitas. Not only do they have a menagerie of heritage chickens, goats, and ducks but they also focus on growing a variety of heirloom vegetables. I was absolutely giddy about my first basket. Bull Blood and Albino Beets, heirloom zucchini, lemon squash, white peaches, green garlic and more! I quickly set to work on recipes that would utilize all this beautiful produce. 85% of this salad was done on the grill, which makes it a perfect summer treat. First, I packaged the Bull Blood Beets, rich in iron and bursting with gorgeous pinks and reds, in foil with a drizzle of olive oil. Then I halved the white peaches, dug out the seed and charred those up nicely on the grill along with slices of lovely lemon squash. Next it was time to build the salad. I used tender butter lettuce from Go Green Agriculture and then layered the beets, peaches and zucchini on top of the lettuce. I drizzled Persian Lime Olive Oil and a Peach Balsamic Vinegar from Baker + Olive and then finished her off with a little crumbled goat cheese. It was AH-MAZE-ING. Steve couldn’t stop talking about it and I can’t wait to show this salad off to guests. Trim the greens off the washed beets and wrap in a foil pouch with a little bit of olive oil. Put on the top rack of a grill-heated medium to high and cook for 45 minutes. Alternately you can do this in the oven at 400º for 45 minutes. 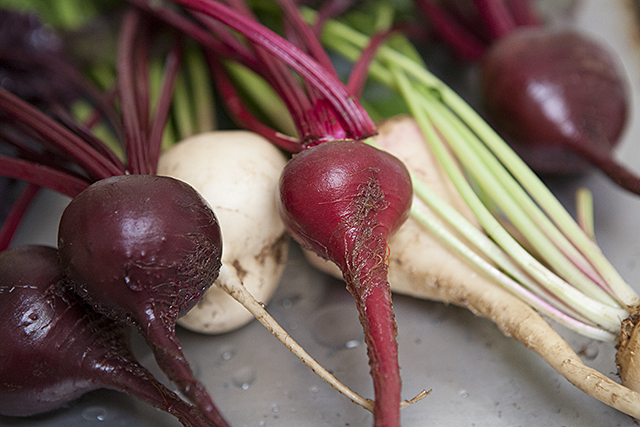 While the beets cook prepare the rest of the ingredients. 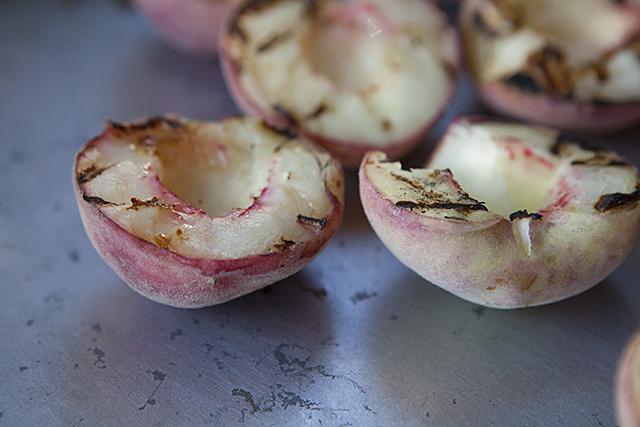 Grill the peaches face side down until slightly charred, 3-5 minutes. Grill the squash at the same time but flip halfway through. Cut peaches and squash into quarters. When the beets can be gently pierced with a fork they are done. Remove them from the foil, peel the skin off and cut into quarters. 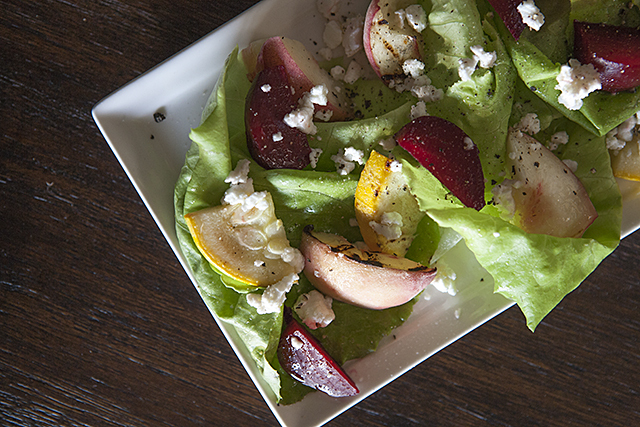 Tear the lettuce into pieces; mix in the beets, peaches and squash. Whisk the vinegar, oil and lime juice together. Dress the salad and sprinkle with goat cheese, salt and pepper. « Cooking Class in Las Vegas!